Being one baby tooth poorer usually translates to being a few bucks richer in the morning, and kids these days are getting higher monetary payments from the Tooth Fairy than ever before. A new survey from Delta Dental has found that the Tooth Fairy’s cash payouts have risen to an all-time high over the past year, up to an average of $4.66 compared to $3.91 in 2015. Experts say this unlikely-but-accurate economic indicator could signify that the economy is headed in a good direction. The Original Tooth Fairy Poll has tracked with the movement of Standard & Poor’s 500 index (S&P 500) for more than a decade, and this year’s poll shows Tooth Fairy payouts are right on target. Last year, the Tooth Fairy shelled out more than $290 million for lost teeth, up nearly 14% from 2015. Per usual, she’s been a bit more generous in exchanges involving a first lost tooth; cash payouts for a child’s first lost tooth are up nearly 10% at $5.72. Regional differences can also determine how much green kids get in exchange for their pearly whites. 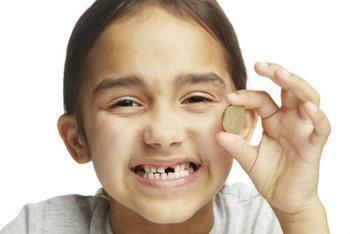 The study found that Tooth Fairy payouts are highest in the West, at $5.96 (almost $7 for the first tooth). In the Northeast, payouts are an average of $5.08. In the South and Midwest, the Tooth Fairy leaves around $4.57 and $4.04, respectively. But losing a tooth does more than raise a child’s net worth. The event marks the imminent arrival of grown up teeth, which can open the door to conversations about the importance of good brushing habits. "In addition to the excitement a visit from the Tooth Fairy brings, she also delivers lessons in finance and good oral health," said Jennifer Elliott, vice president of marketing for Delta Dental Plans Association. "Having conversations with children about good oral health habits, from an early age, can help establish strong habits for a lifetime, and the Tooth Fairy can be a great way to help spark those conversations," Elliott added. Additional findings from the survey showed that cash isn’t the only form of payment used by the Tooth Fairy. In addition to money, she often leaves gifts such as toothbrushes (38%), dental floss (21%), and toothpaste (22%). Nearly 60% of parents said the Tooth Fairy can be a little forgetful, neglecting to pick up their child’s tooth on the first night.